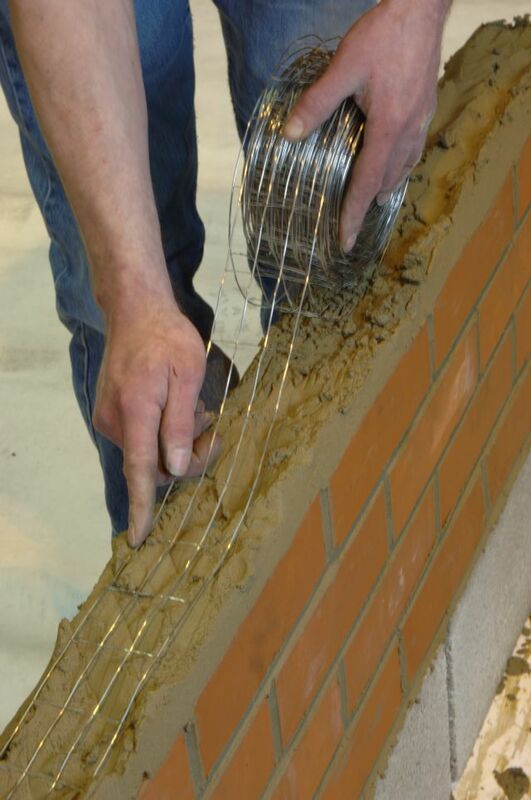 Bricktor Crack Control Reinforcement is manufactured from high tensile wire and designed for bonding and strengthening brickwork, blockwork and stone walls. It lies flat on the masonry mortar joint making the product easy to install compared to other coiled products. Test work carried out has shown the use of Bricktor contributes significantly to enhance the strength of masonry by absorbing tensile stresses which can develop in masonry construction. Bonds and strengthens corners and wall intersections. Resists cracking in areas of uneven settlement. Bonds walls to reinforced concrete frames. Suitable for thin bed-joint construction. Easy folding for corners, curves and angles. Safe to handle and easy to cut and shape on site. Longitudinal wires: 1.25 mm diameter. Cross wires: 0.65 mm diameter. Stainless steel wire: Grade 304S15. Galvanized steel wire: Zinc coated 60 g/m². Bricktor, Stainless steel – External walls. Bricktor, Galvanized steel wire, zinc coated – Internal walls. Supplied in 25 m rolls. Insert code SBT or GBT, plus product width in mm, then CCR; e.g. SBT60CCR or GBT160CCR. 60 mm: Suitable for 100–125 mm wall widths. 100 mm: Suitable for 140–150 mm wall widths. 160 mm: Suitable for 190–200 mm wall widths. 180 mm: Suitable for 215 mm wall widths.